Mike Trout is on the verge of becoming baseball's first half-billion dollar man. "I'm pretty sure I ain't paying one more dinner for him," said fellow Angels star Albert Pujols, in the midst of a $240 million, 10-year deal. "It's well deserved. I don't think there's anybody in baseball besides him who deserves that." Trout's latest deal would top the new $330 million, 12-year contract between Bryce Harper and the Philadelphia Phillies, and Trout's $36 million average annual value would surpass pitcher Zack Greinke's $34.4 million in a six-year deal with Arizona that started in 2016. The contract also would best Mexican boxer Canelo Alvarez's $356 million deal with sports-streaming service DAZN. Whether Trout's contract is the largest in the world for a team athlete is difficult to determine. Forbes estimated Lionel Messi earned $84 million from Barcelona in 2017-18 and Cristiano Ronaldo $61 million from Real Madrid, but precise details of their contracts are not known. "You think about Angels, you think about Mike Trout," Los Angeles shortstop Andrelton Simmons said, "You locked up the best player in the game. That's a big first step to take. You can build off of that. That's a good base to the house." Trout's deal would include a signing bonus and supersede the $144.5 million, six-year contract that had been set to pay him $33.25 million in each of the next two seasons. While the marketplace has been slow for many players this offseason, prompting complaints from the players' association, top stars have gained robust deals. Four of the largest seven contracts will have been agreed to since Feb. 19, with Trout and Harper joined by Manny Machado ($300 million for 10 years with San Diego) and Nolan Arenado ($260 million for eight years with Colorado). A 27-year-old entering what should be his prime years, Trout is considered baseball's top player and would have been coveted as a free agent after the 2020 season. He lives in southern New Jersey, and Harper said he was excited about trying to recruit Trout to join him in Philadelphia. 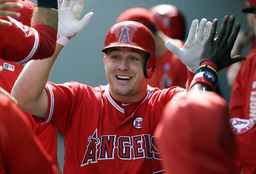 Although Trout recently built a home in his native Millville, New Jersey, he is staying on the West Coast with the Angels, who are coming off three straight losing seasons and haven't won a playoff game during his career. Trout and wife Jessica have made no secret of how much they enjoy living in laid-back Southern California, and the low-key outfielder decided to skip the pressure of free agency entirely. Trout has a .307 average with 240 homers, 648 RBIs, 189 steals and 693 walks in eight big league seasons. He was voted AL Rookie of the Year in 2012, won the AL MVP award in 2014 and `16 and finished second in MVP voting four times, tying the record shared by Stan Musial, Ted Williams and Pujols. Big-money deals have not worked out for the Angels in the past. Pujols reached his big deal with the Angels before the 2012 season but has not matched his previous performance with St. Louis. Josh Hamilton signed a $125 million, five-year contract before the 2013 season and contributed just 31 homers and 123 RBIs in two years with the Angels. Trout has reached the playoffs just once, when the Angels won the AL West in 2014 and were swept by Kansas City. Los Angeles is coming off three straight losing seasons, and Brad Ausmus replaced Mike Scioscia, the team's manager since 2000. Los Angeles has a lucrative television contract, a fan base that has packed Angel Stadium with 3 million fans for 16 consecutive seasons and an owner in Arte Moreno who rarely hesitates to spend. The Angels' farm system has improved sharply during general manager Billy Eppler's three-year tenure. AP Sports Writer Greg Beacham in Los Angeles and AP freelance writer Carrie Muskat in Tempe, Arizona, contributed to this report.